Classic, simple, and almost universally effective, the waiter's style corkscrew continues to be one of the best options of wine openers available. It fits around any style of bottle neck and allows you to completely control the force, speed, and angle with which you extract the cork. It is well suited to opening any type of cork including composite, natural, synthetic or fragile corks. It's design makes it compact and easy to store in a drawer, picnic basket, or apron and many stiles include foil cutters. 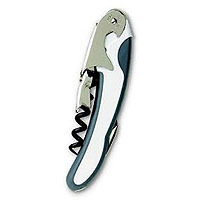 If you are a wine drinker this opener is a must!